Classes start the day after Labor Day for my kids, so they made the most out of enjoying one last hurrah of water activities playing around outside with some items Prime Time Toys sent us to try out before they had to head back to school. 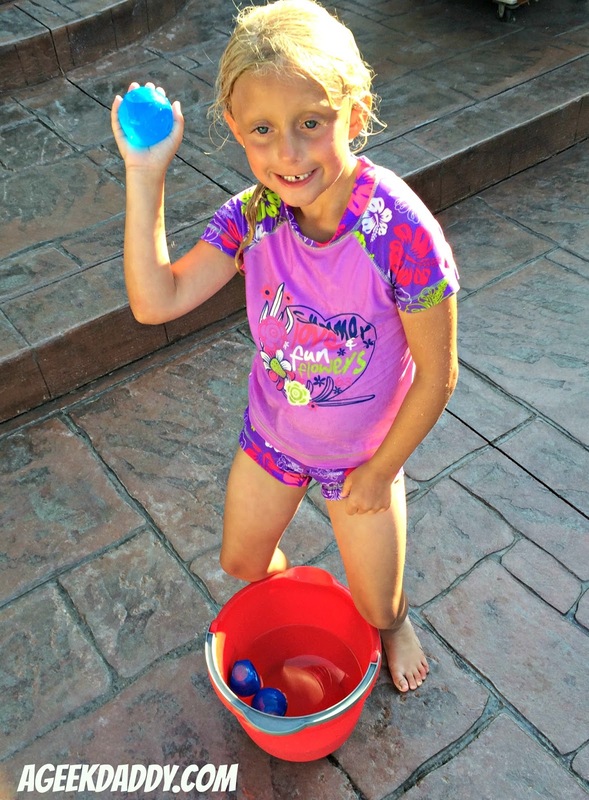 Since 1990, Prime Time Toys has been producing fun toys and games that can be enjoyed both in and out of the water like the Hydro Swirl Spinning Sprinkler and Hurricane Reusable Water Balls that my kids had a lot of fun with on Labor Day. It was a sunny, hot day perfect for getting wet in the backyard and these toys really were great at keeping the kids entertained plus cooled off. 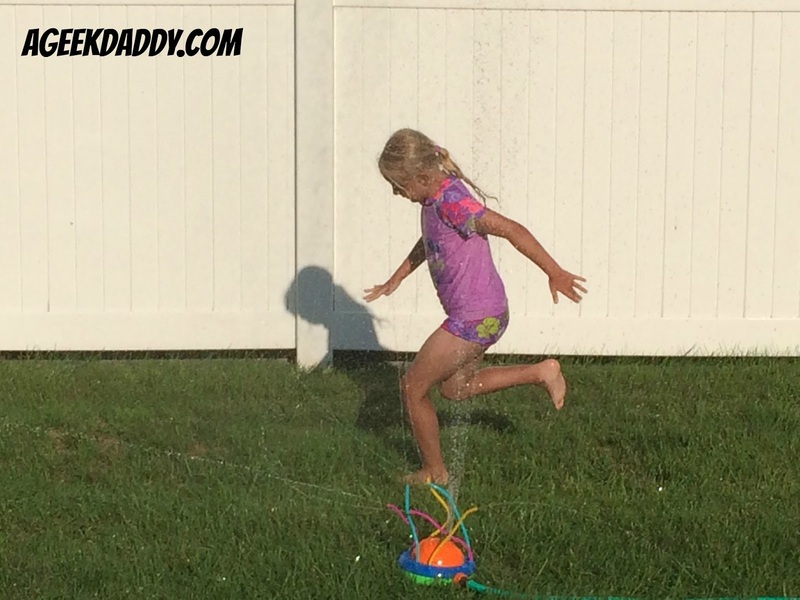 The Hydro Swirl Spinning Sprinkler available at Target provides a new twist on running and jumping through a sprinkler. It's middle section features a hydro powered spinning dome so that water shoots out of its top in a whirling motion up into the sky. Plus six wiggle tubes on its edge send water spraying all about the sprinkler in various directions. Rather than having a primary purpose for watering lawns, this sprinkler is designed specifically for kids to splash in on hot days. From our experience using the sprinkler it worked really well at providing my kids with a good soaking and they really had fun using it to cool off. The sprinkler worked so well that we'll absolutely be storing it over the winter to bring out again to use next summer. Speaking of storing it, I really liked the tabs on the bottom of the Hydro Swirl Spinning Sprinkler to insert its wiggle tubes in which assist with being able to pack it up without damaging them. My kids also cooled off tossing Hurricane "REUSABLE" Water Balls at each other. These provide the fun of playing with water balloons without the hassle of having to tie knots or cleaning up a mess of broken plastic bits. Place a Hurricane Water Ball in a bucket of water and with a quick squeeze it will fill up and self-seal. 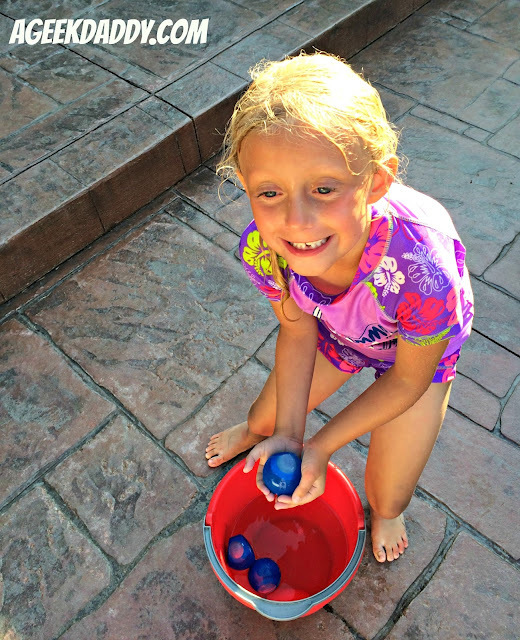 You can toss and throw these reusable balls just like a water balloon. The best part is you can use them over and over again as they're good for up to 1,000 watery splats. Kids will have a blast tossing these about. You can find them at Amazon.com. For more information about the Hydro Swirl Spinning Sprinkler, Hurricane Water Balls, or other products available from Prime Time Toys please visit primetimetoys.com.